What is Eastern filbert blight? Eastern filbert blight is a potentially serious fungal disease found throughout the United States, including Wisconsin. It affects only Corylus species, commonly known as hazelnuts or filberts. On hazelnuts native to Wisconsin such as American hazelnut (Corylus americana) and beaked hazelnut (Corylus cornuta), the disease causes little significant damage, but on the commonly grown European hazelnut (Corylus avellana), including Harry Lauder’s walking stick (Corylus avellana ‘Contorta’), the disease is lethal. Turkish filbert (Corylus colurna) also appears to be highly susceptible. Eastern filbert blight can cause small black cankers that form in rows, or deep gouges in the bark of severely infected trees/shrubs. football-shaped stromata (the reproductive structures of the causal fungus). The stromata often form in rows of two. Cankers first appear on new twigs and expand over time. 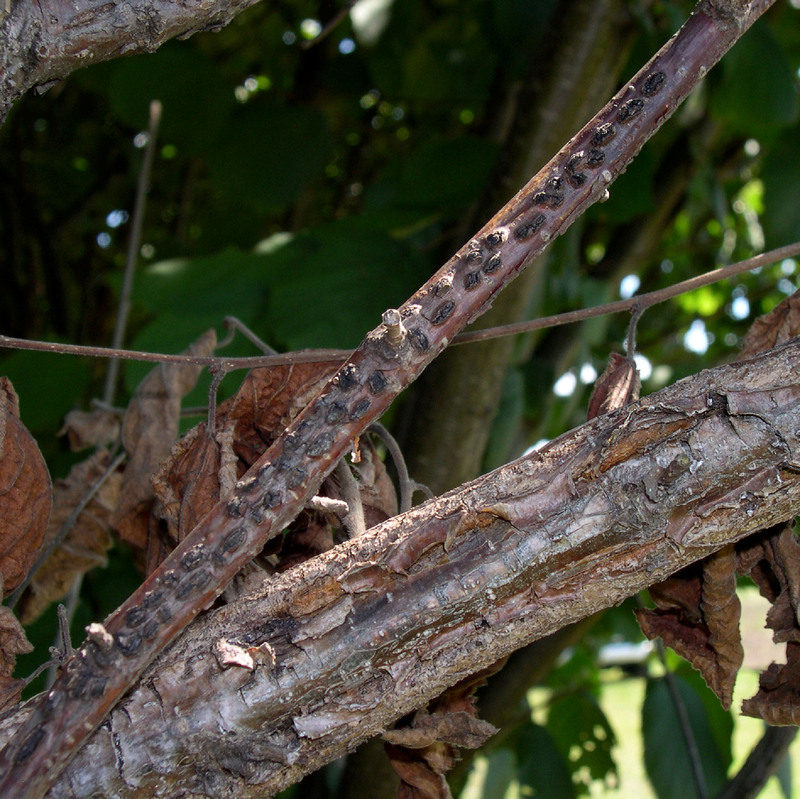 American hazelnut trees/shrubs are able to live almost indefinitely with Eastern filbert blight, forming a small number of slowly-expanding cankers (if any cankers form at all) that lead to limited branch dieback. On European hazelnut however, cankers will expand anywhere from one inch to three feet in a year, and can eventually form long, deep gouges or grooves on severely affected trees/shrubs. European hazelnuts typically die due to girdling from Eastern filbert blight within five to 10 years. Where does Eastern filbert blight come from? Eastern filbert blight is caused by the fungus Anisogramma anomala. Stromata formed by the fungus produce spores that are spread short distances by water splash and over longer distances by wind. Humans also can spread Anisogramma anomala on their hands and clothing, on gardening tools, and by transporting wood from infected trees/shrubs. Unlike other canker fungi that can infect through wounds, the Eastern filbert blight fungus primarily infects through immature tissue on actively growing shoots. Cankers appear 12 to 18 months after infection. Eastern filbert blight does not affect hazelnut leaves, fruits or nuts. How do I save trees/shrubs with Eastern filbert blight? There is no cure for Eastern filbert blight. If only a few branches on a tree/shrub are affected, prune these branches two to three feet below each canker. Disinfest tools after each cut by dipping them for at least 30 seconds in a 10% bleach solution or (even better) a 70% alcohol solution. Alternatively, use a spray disinfectant containing roughly 70% ethanol, spraying tools until they drip and then allowing them to air dry. pruning would require removing part of the trunk, or when trunk cankers are present), removal of the tree/shrub is the preferred management strategy. Pruned branches and removed trees/shrubs should be burned (where allowed by local ordinance), deep-buried, or chipped (as long as the chips are allowed to dry to kill the fungus). How do I avoid problems with Eastern filbert blight in the future? Consider planting native species of hazelnut (e.g., American and beaked hazelnut) that are naturally resistant to the disease. If you decide to plant European hazelnut, select cultivars that have been bred for resistance. ‘Jefferson’, ‘Santiam’, ‘Yamhill’, and ‘Theta’ are resistant, nut-bearing cultivars. ‘Red Dragon’ is a resistant, ornamental cultivar. Note that these cultivars are not hardy in all hardiness zones in Wisconsin. Hybrid hazelnuts (crosses between American and European hazelnut) are becoming increasingly available, but should be used with caution because their susceptibility to Eastern filbert blight has not been adequately tested. Once hazelnut trees/shrubs are established in your yard, routinely inspect the plants for infection and remove infected branches as they occur. Watch for dying branches in the summer and cankers (particularly on or near the youngest growth) in the winter. Inspecting trees during the winter is very important, because cankers are more visible at that time. Fungicides can be used for management, but should only be used as a last resort. Not all fungicides that are approved for Eastern filbert blight control are particularly effective, but chlorothalonil has been shown to be an effective preventative treatment, although it will not cure existing infections. Note that not all formulations of chlorothalonil are approved for use on nut-bearing hazelnuts; many formulations can only be used on ornamental hazelnuts. Therefore, if you decide to use chlorothalonil, be sure to select the appropriate formulation for your particular situation. Apply the first treatment at bud break (i.e., when half the buds show a separation of leaves) and additional treatments (up to three) every two weeks thereafter. If you plan to eat nuts from your hazelnut tree, make sure that your last fungicide treatment is applied at least 120 days before anticipated nut harvest. For further details about recommended fungicides, spray rate recommendations, and diagrams of bud stages, see “Pest Management Guide for Hazelnuts in the Willamette Valley”, Oregon State University Extension Bulletin EM8328 available at https://catalog.extension.oregonstate.edu/em8328.